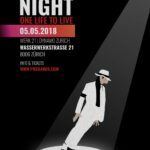 PMERANUS is proud to present an exciting party where guests will be able to dance the night away to the rhythm of some of the best Michael Jackson songs of all times! There is no doubt that this icon of global pop music really redefined the way people think of great songs, combining genres as diverse as pop, funk,rock and R&B into one hot package. Whether you are a die-hard Michael Jackson fan or you simply love dancing to great grooves, you will love Jackson’s Night! If you want to join the event, you can purchase tickets directly through our pre-sale, from now on. Our Jackson’s Night is for all lovers of great music, joy and celebration!